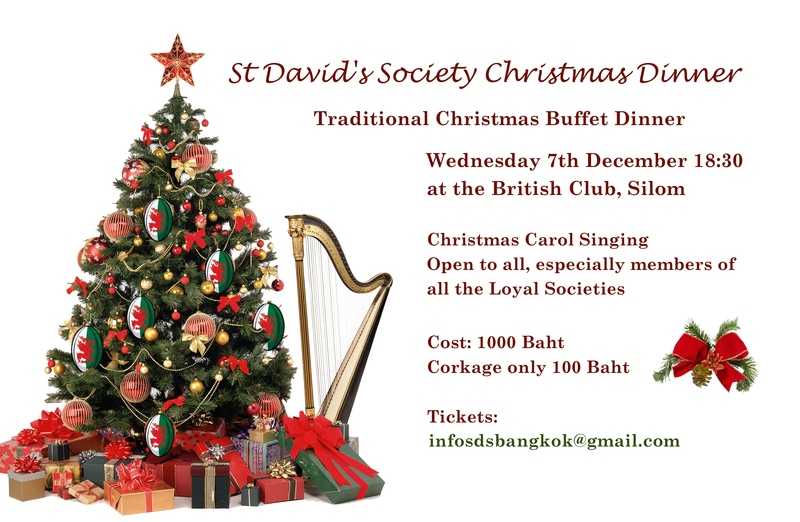 St. David’s Society is the society that represents Welsh people in Thailand and it was established in 1976 and its first Bard was Mr. Eric G. Howell. Since 1976 the society has grown from strength to strength. The society’s membership requirements are flexible and the current membership comprises of people resident in Thailand that either have direct links with Wales, who have studied or lived there or have Welsh ancestors. Each year the committee is appointed at the AGM in May and a plan is drawn up comprising of a number of quality events which in the past has includes a Murder Mystery night, a Quiz night, a Wine Tasting evening, a Christmas dinner, the Intersociety’s Golf event, a Poems & Pints evening as well as the flagship event being the St. David’s Society Annual Ball which is held in March every year and usually on the closest Saturday to St. David’s Day which of course is March 1st.